2019 Academy Award, Capri Hollywood, & BAFTA awards: Best Documentary Feature; Critics’ Choice Documentary Awards: Most Compelling Living Subject, Best Cinematography, Most Innovative Documentary, Best Sports Documentary; 12 other wins, 44 nominations. By the age of 30, Alex Honnold was known as one of the most accomplished rock climbers of his generation. He was featured in adventure magazines and authored the memoir ‘Alone on the Wall.’ But he remained obsessed by a challenge that no climber had ever achieved: to ascend free solo — without safety ropes — up the 3,000-foot cliff of El Capitan in California’s Yosemite National Park. Directors E. Chai Vasarhelyi and Jimmy Chin previously made the acclaimed mountain-climbing movie, “Meru.” They follow Honnold over two years as he tests the limits of his ambition. “If you’re seeking perfection, free soloing is as close as you can get,” Honnold declares. But Chin, an experienced adventure photographer who’s cheated death before, has a different take: “If you’re pushing the edge, eventually you find the edge.” Honnold has long been a loner, living out of his van for nine years. We watch as he makes lifestyle changes with a new girlfriend, Sanni, who exudes patience but still frets over him. Will that emotional attachment be helpful or harmful when he needs total concentration? 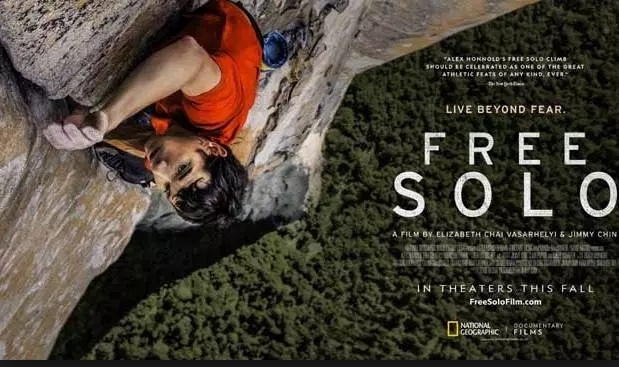 It’s Honnold’s strange unnerving confidence that somehow placated McCandless and allowed the filmmakers to watch and document his stunningly dangerous climb. All of it, the climb and the intensity of watching, is breathtaking.